SEARCY, Ark. — Dr. Bruce McLarty, 55, vice president for spiritual life at Harding University, has been named to succeed Harding University President David B. Burks when Burks retires from the position in June. The announcement of McLarty’s selection was made today by Dr. John O. Simmons, chairman of the school’s board of trustees. Simmons also served as chairman of the six-member Presidential Succession Process Committee, which created and executed the plan allowing the entire board to review all applications from candidates for the position. Harding’s board met in its regular semi-annual meetings on Oct. 26-27 and made the decision to name McLarty to the post. The decision comes one year after Burks announced his intention to retire from the presidency at the end of the 2012-2013 school year. Burks will become chancellor of the University in June. For more than nine months, the Presidential Succession Process Committee had accepted and reviewed applications from those seeking to serve as the Harding’s chief executive officer. Commenting on the McLarty’s selection, Simmons said, “We are very pleased to announce that Dr. Bruce McLarty will be the next president of Harding University. The Board of Trustees had the privilege of working with an outstanding pool of applicants for what I consider to be one of the best jobs in the world. Harding’s president gets to work with our faculty, staff and wonderful students who continue to choose to come to Harding for their education, spiritual growth and maturation. “Dr. McLarty is a leader, not in the mold of a typical CEO or academician, but he is a servant leader with a very bright mind, a keen insight into people and the ability to communicate effectively. He brings energy and a clear vision of the mission of Harding to the table, and he will be an effective leader as our fifth president. “I have great confidence in Dr. Bruce McLarty, and I believe he will be an outstanding president for Harding University,” said Burks. “Dr. McLarty has a very solid grasp on the spiritual mission of Harding and has written about it, helping the faculty in understanding this powerful mission. “He has been a valuable member of my administrative team for the past seven years. He has a valuable background as a pulpit minister, teacher, dean and vice president for spiritual life. This will be great benefit to him as he assumes this new role. McLarty entered Harding as a freshman in 1975 following his graduation from Harding Academy in Memphis. He received his bachelor’s degree in Bible from then Harding College in 1978. In 1982 he received the Master of Theology degree from Harding School of Theology in Memphis. In 2010 he was awarded the Doctor of Ministry degree from Ashland Theological Seminary in Ashland, Ohio. 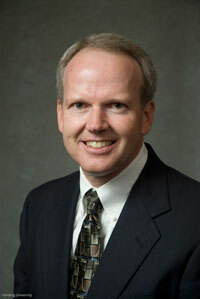 McLarty joined Harding’s administrative team in 2005 serving as both vice president for spiritual life and dean of the College of Bible and Ministry. He served in the dual positions until 2008. Since that time he has served only in his vice presidential role. In this position he oversees College of Bible and Ministry, Counseling Center, Center for Leadership and Ministry, Center for Spiritual Leadership, Center for World Missions, Center for Advanced Ministry Training and Abundant Living ministry. Prior to joining the Harding faculty, McLarty served as a minister for congregations in Arkansas, Mississippi and Tennessee. He and his family had also served 15 months as missionaries in Meru, Kenya, in East Africa. For 14 years McLarty was the pulpit minister for the College Church of Christ in Searcy, Ark. During his tenure at Harding, McLarty has been a frequent speaker at lecture series on other college campuses including Abilene Christian University, Freed-Hardeman University, Lipscomb University, Ohio Valley University, Oklahoma Christian University and Pepperdine University. His has been a guest lecturer in several European countries. McLarty is editor of the Abundant Living magazine published by Harding. He is the author of two books and more than two-dozen other articles for publications. In 1999 he received the Outstanding Alumnus Award from the College of Bible and Ministry at Harding. McLarty is married to the former Ann Hutson, a Harding alumna and currently a nurse in Harding’s Health Services Center. The couple has two grown daughters.